← TGOC2018 – A photo a day – Day 8 – Where’s the water gone? 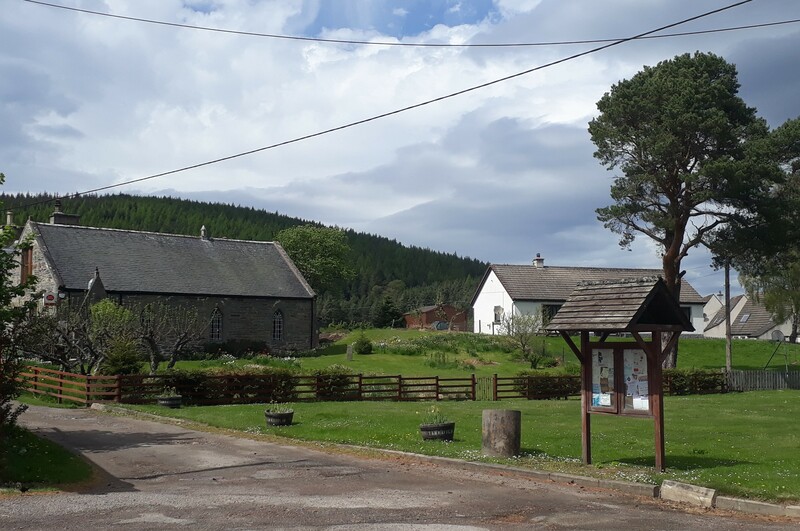 As I walked the Speyside Way and Glenlivet Estate paths towards Tomnavoulin, I daydreamed about the options for rest, food and drink which awaited me. It would be good to have a proper break there. There was a Post Office marked on the map, so maybe there would be a shop – perhaps with a little café? I created a mental priority list of how good Tomnavoulin’s facilities were going to be. At the top of the expectations list was a café with pots of tea, slices of thick toast with lashings of butter, and flush toilets with hand basins with warm water and perfumed soap. Or maybe there’s just be a small shop in the Post Office. They’d have a hot drinks machine and I’d sit outside on the bench with a cup of tea and a sandwich. Or, if there was no hot drinks machine, at least I could buy a bottle of lemonade. Knowing that it was better to set my sights low to avoid disappointment, my simplest expectation was a bench on which I could sit and eat the cheese roll from my rucksack and drink the water I’d brought from Tomintoul. Arriving at Tomnavoulin I found that the shop had now closed for good and the Post Office operates out of a converted church [left of photo]. It was closed. There was no bench. Well, there was a bench but it was through a gate near the Post Office / Church and I wasn’t sure if it was intended for passing weary travellers or belonged to a private residence. I plonked myself down on the grass, took off my shoes and tucked into my cheese roll. Oh, well! It was Sunday, so maybe I was expecting too much, and at least it wasn’t raining. This entry was posted in TGO Challenge and tagged TGOC2018, Tomnavoulin. Bookmark the permalink.